I've changed what I've done every two or three years. It's all design, the form just changes. 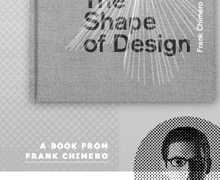 We first featured Frank Chimero on Day 24 and lucky for us he had some time to reflect on the changes in his practice, philosophies, and the lenses we use to understand ourselves. Thinking about design problems as human problems makes us more empathetic to the reasons why we make, and who we are making things for. We should create in order to solve bigger problems and connect emotionally with the person on the other end. We build things, learn from our mistakes, glean morsels of insight from our experiences, and move on to the next thing—hopefully a little wiser. To wrap up our conversations with our contributors we ask the question, if you had to choose one: Kern or Burn? We love Frank’s response. More thoughts from Frank on “the stuff that makes life big” to come in our printed publication. We can’t wait for you to read them.